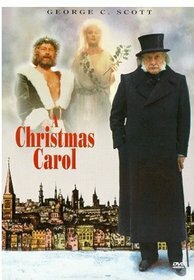 There are many different cinematic incarnations of Charles Dickens’ 1843 classic holiday tale A Christmas Carol. It seems as if there are as many different versions, variations, and spoofs of this story as there are of Dracula and Frankenstein. One of the more memorable retellings of Dickens’ masterpiece is the 1984 made-for-television version, directed by Clive Donner and starring George C. Scott. While the direction of the film is fairly pedestrian, the overwhelming performance of George C. Scott vaults it to a marvelous level. This is this author’s personal favorite version of the tale of Ebenezer Scrooge. It is another Christmas Eve in a harsh, Victorian winter, but the miser Ebenezer Scrooge (George C. Scott) couldn’t care less. He is much more concerned with what he believes to be the wasteful activities of his assistant Bob Cratchit (David Warner), and avoiding the invitation to Christmas dinner from his nephew Fred Holywell (Roger Rees). When he arrives home, he is soon greeted by the ghost of his late partner Jacob Marley (Frank Finlay), who warns him that, unless he changes his miserly ways, he will be doomed to walk the earth for eternity. He is later visited by the ghosts of Christmases past, present, and future, who slowly convince him of the terrible person he has been. He awakens the next day a new man, determined to be generous and to keep the spirit of Christmas alive the whole year long. While this is a Christmas tale, Donner doesn’t ignore the more horrific elements of the story. He realizes that Scrooge must be scared indeed in order to make him change his miserly ways. As will be discussed later, the ghost of Jacob Marley is a fairly gruesome sight. More frightening is the Ghost of Christmas Future. He has the appearance of the Grim Reaper, and, as in the story, he has no dialogue. He utters eerie screeches and points skeletal fingers, but never speaks to Scrooge. These elements always remind us that A Christmas Carol is not merely a feel-good Christmas story, but a well told ghost story with a potent moral. Much of the dialogue in this very faithful adaptation comes straight from its pages, which lends a genuine Dickensian feel to the film. The film takes its time with the visions of the past, present, and future, allowing us, as the book did, to see how Scrooge became the man he was, as well as get a feel for the warmth of Fred’s family and the stark poverty of the Cratchits. We see almost every individual episode from the short story, and nearly all the characters are represented well. This respect to the short story shines through the film, allowing Dickens’ story to tell itself with no undue interference from screenwriter Roger O. Hirson or Donner. 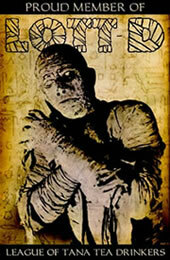 The supernatural elements of the story are also presented well, particularly in the case of Marley’s ghost. He is gray all over, and he wears the infamous chain that he forged while he was alive. One impressive detail is that he wears a cloth around his head to keep his mouth closed. When he removes it, his jaw sags open in a most unsettling fashion. Frank Finlay is able to take these elements and forge an outstanding performance, screaming about his fate but yet still concerned with Scrooge’s soul. Finlay imbues the character with sense of fear and pathos at the same time; his agonizing cries of anger and his sudden manner of speaking are very frightening, but he still skillfully shows his sadness and overall humanity throughout. Other ghosts are also handled in a fine manner -- each one appearing and behaving much as they did in the story. This adaptation, even with its strengths, would have been an extremely average film if not for the stellar cast with which is blessed. To a person, everyone in the cast is outstanding, with few exceptions. David Warner plays Bob Cratchit as a man who is in a humiliating situation but somehow manages to keep his dignity and his humanity intact. Warner invests Cratchit with strong deference to Scrooge, but it is when he is with his family that Warner truly shines. During their Christmas dinner, Warner plays Cratchit with optimism and contentment despite his impoverished circumstances. After the death of Tiny Tim, Warner is even more superb. Constantly on the verge of tears, he tries to change the subject and talk about something else, but pitifully breaks down. It’s very obvious that when Cratchit says, “I am a happy man,” he’s really trying to talk himself into it. Of all the performances in the film, Warner is only outshone by George C. Scott. A lesser actor can make Ebenezer Scrooge seem ridiculous, vicious, or into a Victorian Mr. Howell. In George C. Scott’s hands, however, Scrooge is actually a three dimensional character who, while not a nice person, is not a hissing villain. In an early scene when he is mocking Christmas, he seems very pleased with a sad joke he has made up, but Scott doesn’t overdo it. He also doesn’t go over the top with the frequent “humbugs” that he always seems to be saying. Most importantly, Scott demonstrates Scrooge’s dimensions, which allows us to believe that he could honestly change his ways and become a truly good person. When portraying the reformed Scrooge, Scott doesn’t go overboard in making Scrooge the opposite of his old self. He seems like a better version of the person we have spent the film with, not a completely different one. Scott’s performance vaults this film to an outstanding level. If there is a single major fault in the film, it is Clive Donner's direction. Each scene is presented very flatly, with the camera merely following the actors. We rarely see any memorable cinematography, and even the supernatural elements are filmed with just the bare minimum of directorial flair. Perhaps the fact that this is a made-for-television adaptation constrained Donner from doing anything that risked being even slightly confusing. Overall, this is one of the best and most enjoyable versions of A Christmas Carol. The direction is professional (if uninspired), the adaptation is very faithful to the source, and the cast is stellar. This retelling of Dickens’ classic tale is a must for every Christmas season. Submitted by Anonymous (not verified) on Mon, 2009-12-07 18:26. Submitted by Irish14ever (not verified) on Sun, 2009-12-27 07:09. This has always been my favorite version of the Dickens tale! George C Scott does an outstanding job! Submitted by Nicole (not verified) on Sun, 2010-10-24 10:29. I got the part of Caroline the poor wife and on of Fred's guests in my high school's theatre company production :D and im also the make up artist..cant wait! Submitted by faygokid (not verified) on Thu, 2010-11-25 18:03. Each year that goes by, this is recognized by more and more reviewers as the definitive, and best, A Christmas Carol. (Check Salon magazine last year.) It takes a while, I guess, but in 2010, it's time to put all argument aside - no knock at 1951's Alistair Sim version (the year I was born), but this is the best, with the best supporting performances, and Scott's magnificent Scrooge. You're too tough on Donner - the scenes hold up, and very well. It's a beautiful and heartfelt production, and it's Christmas, and the best. Submitted by Melanie Link Taylor (not verified) on Sat, 2013-06-01 18:20. I agree. David Warner was a superior Cratchit.